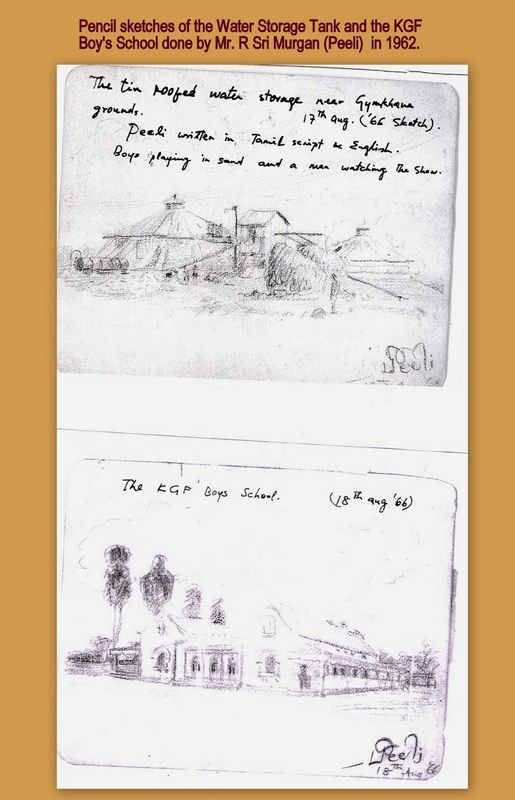 Pencil Sketches of the KGF Boy's School and the Tin Roof Water Storge Tank near the KGF School, Oorgaum , KGF by Mr R Sri Murugan an ex resident of KGF in 1966. Mr. 'R Sri Murugan' who was born and studied in KGF is an engineer by profession. He worked as a civil engineer for nearly 20 years. He also freelanced as an artist for various architects, design centres and builders and promoters. He coined the term 'Peeli' meaning peacock, in tamil literature, that he studied in school. His drawings and paintings bear this name for over 50 years. He specializes in line sketches, and paintings in various mediums. In addition he has also created murals and metal etchings for various clients. He now lives in Hyderabad.